We’d love your help. Let us know what’s wrong with this preview of The Doldrums by Nicholas Gannon. Archer longs for adventure. Grand adventures, with parachutes and exotic sunse Archer B. Helmsley has grown up in a house full of oddities and treasures collected by his grandparents, the famous explorers. He knows every nook and cranny. He knows them all too well. After all, ever since his grandparents went missing on an iceberg, his mother barely lets him leave the house. Archer longs for adventure. Grand adventures, with parachutes and exotic sunsets and interesting characters. But how can he have an adventure when he can’t leave his house? It helps that he has friends like Adélaïde L. Belmont, who must have had many adventures to end up with a wooden leg. (Perhaps from a run-in with a crocodile. Perhaps not.) And Oliver Glub. Oliver will worry about all the details (so that Archer doesn’t have to). To ask other readers questions about The Doldrums, please sign up. is it fun to read for 11 year old? Is there a second book to this? THIS WAS SO GREAT. Such a unique and interesting story and I want MORE. I mean, is this a series? TELL ME THIS IS A SERIES. I want to know more about the grandparent's and their strange society. I also just want another adventure with Archer, Oliver, and Adelaide. AND THE ILLUSTRATIONS, OH MAN, THEY ARE BEAUTIFUL. If you're looking for an exciting, mysterious, and fun middle grade book, check this one out! Highly recommend. Spoilers? If you can even be spoiled for a book where (spoiler alert) very little happens and nothing is revealed. I am editing this review to say the following: After a friend of mine read this book and found the same problems I did, I went to research the deal on Publishers Marketplace and was appalled to find out that this was sold in a major two-book deal. That's at least $500k. For one book that is just a vague prologue, really, and for another that I will definitely not be reading because t Spoilers? If you can even be spoiled for a book where (spoiler alert) very little happens and nothing is revealed. I am editing this review to say the following: After a friend of mine read this book and found the same problems I did, I went to research the deal on Publishers Marketplace and was appalled to find out that this was sold in a major two-book deal. That's at least $500k. For one book that is just a vague prologue, really, and for another that I will definitely not be reading because this should have been one book so that there was actual momentum. Surely no one thought this was going to compare to Brian Selznick, right? Back to the review: Okay, I wanted to give it two stars because the illustrations were competent enough, but they didn't help add any intensity to the story and the story was a huge, huge problem. So though the palette was nice and the lighting was nice, I just... don't think of them. I think of how I was cheated out of a story. This is a one star book. Not because of anything particularly horrific or bad, but because I just didn't get a sense that anything... happened. The title must reflect the feeling you're supposed to get while reading this for 340 pages, because otherwise it doesn't make much sense. Yes, Oliver's father's paper is The Doldrums Press, but other than that, it's just kind of arbitrary. Because, okay, yes, Archer is locked in his house... Only in the sense that he's allowed out of it for school (where he goes out on the town to meet with Adelaide and Oliver) and freely continues sneaking to visit his two child neighbors. Almost every day. Without ever being caught. So, really, he's certainly not trapped. Also, I do not understand, and it is never fully justified, why Archer's mother decides to "trap" her young son inside, and why his father just goes along with it. I mean, it makes no sense at all. His grandparents were presumed lost on an iceberg. How a nine to eleven-year-old boy would meet a similar fate and therefore need to be locked up (except for school) is beyond me. His mother doesn't seem irrational or upset. She doesn't even seem to like Archer's grandparents, for reasons vaguely explained in the last chapter. Overall, Archer's being trapped feels very forced. His mother never even checks on him, allowing him to journey across town with his friends, and return, without being noticed. Since we never find out anything substantial regarding Archer's grandparents, I guess the real antagonist in the novel is Aunt Marge Trunchbull Mrs. Margery Murkley? Who is really a mishmash of other, better-developed nasty characters and serves less of a purpose. Because I didn't feel that Archer was really trapped, and that there weren't any real antagonists that might really do something to interfere with plans that were so outlandish and only developed in the last third of the book, I didn't feel any tension. In fact, at first I thought, okay, the book will cover the summer and Archer's attempts to get out of the house. But no, summer ends very quickly and he never gets out of the house (well, with permission) and it's never addressed again. We instead move into the new school year and the arrival of Mrs. Murkley/Aunt Marge/Trunchbull, who may or may not have a past with the Nice Librarian Character (I was going to laugh hysterically if it was revealed they were related... but nothing was revealed). 1.) Precisely why Ralph and Rachel Helmsley were not welcome in their own house, to visit their grandson. They are seemingly just a pair of explorers who got lost. A quick paragraph in the final chapter, vaguely talking about how OTHER people in Ralph and Rachel's circle were... strange? isn't enough to make things satisfying. I mean, there's no allusion to magical worlds or nefarious associations, apart from two old sea dog types who knew them. 2.) Mrs. Marge Murkley Trunchbull's past, regarding why she left her previous school. 3.) What her relationship may or may not be with the librarian. Okay, so, those are actually the only mysterious plot points in the novel. And not one of them was given a satisfactory explanation. I've said it before and I'm going to say it again: there is a serious First Novel of a Series problem going on in current MG and YA. Regardless of a novel's series potential, it needs to stand alone, with just enough left to make the reader wonder what will happen next. The reader should not be reading onward because the author never explained what was going on in the first book. Think about the first Harry Potter book. It ends very neatly. Yes, obviously we know the Voldemort problem isn't really solved, and Dumbledore gives us answers that we only later learn are half-truths. But we don't feel they are half-truths at the time. Rowling is not trying to create cliffhangers. Why Harry survived, for example, is provided to us. Voldemort is vanquished for the second time. The school year ends. The reader may or may not want to see what happens in the second year, but everything they read in the first book was wrapped up. Think about if, instead, the first HP book was entirely about the Dursleys being paranoid about Harry and Harry wondering why he does these weird, seemingly magical things. Then, in the final chapter, Hagrid appears and the Dursleys are forced to vaguely allude that they know something is going on but we still never find out what Harry is. And then it ends. This is the most wonderful book I've read in the past few months! I did not imagine I would be as consumed as I was with it, but not only is it a beautiful book to own and to look at, it is also a great story put together by the extremely talented Nicholas Gannon. The story involves eleven year old Archer Helmsley, whose family knew he was a dreamer from the day he was born, not unlike his grandparents, Ralph and Rachel Helmsley, who are very well-known explorers. His parents are more grounded i This is the most wonderful book I've read in the past few months! I did not imagine I would be as consumed as I was with it, but not only is it a beautiful book to own and to look at, it is also a great story put together by the extremely talented Nicholas Gannon. The story involves eleven year old Archer Helmsley, whose family knew he was a dreamer from the day he was born, not unlike his grandparents, Ralph and Rachel Helmsley, who are very well-known explorers. His parents are more grounded in reality, with his father being a lawyer, and his mother trying her best to keep him away from his grandparents' influence, because she disapproves of them and their lifestyle. However, living in his grandparents' house, which is filled with objects they have collected throughout their countless expeditions, makes it difficult for his imagination to stand still. He dreams of becoming an explorer and leaving the house. More so, he dreams of starting an expedition to Antarctica to find his grandparents who have gone missing on an iceberg two years prior. Archer is completely alone and a prisoner of his own home, until Oliver Glub enters the picture and meets Archer through their neighboring balconies. Oliver is a little more grounded and is therefore a good partner in crime to Archer's crazy ideas. Add to that Adelaide Belmont, the French girl with one leg allegedly eaten by a crocodile, who has recently moved in next door and provides the support Archer needs to plan this expedition, but also endless amount of delicious croissants and coffee, and you have yourself a solid trio ready to go on this crazy adventure. With the help of his two new friends, Archer finds himself trying to overcome many obstacles, not in the least that of his overprotective mother and scary new teacher. A wonderful, adventurous story that keeps you invested in all the characters and rooting so badly for the three children, who each agree to go with this mad plan for different reasons, and with the beautiful illustrations and artwork, you have yourself a keeper. Trigger warnings for ableism, bullying, injury and animal cruelty/death. 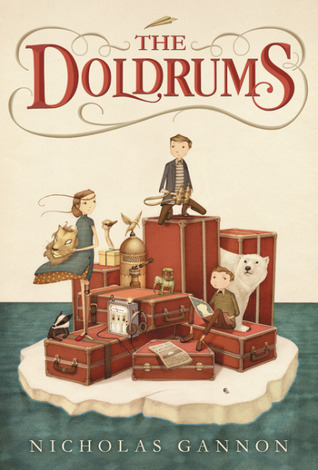 The Doldrums made empty on its promise of being a whimsical adventure story. Despite being over 400 pages, barely anything happened. Both the nonexistent plot and writing style were so drab and lifeless, I was tempted to DNF it multiple times. The majority of the characters, including our protagonist, Archer, had little personality; even Mrs Murkley felt like a copy-and-paste Aunt Marge, rather than her own fleshed out antag Trigger warnings for ableism, bullying, injury and animal cruelty/death. The Doldrums made empty on its promise of being a whimsical adventure story. Despite being over 400 pages, barely anything happened. Both the nonexistent plot and writing style were so drab and lifeless, I was tempted to DNF it multiple times. The majority of the characters, including our protagonist, Archer, had little personality; even Mrs Murkley felt like a copy-and-paste Aunt Marge, rather than her own fleshed out antagonist. The only exception was Archer's friend, Oliver. He was my smol ray of sunshine, bless him. The other thing that bothered me greatly was Adélaïde's disability representation. While I cannot comment on it from a personal experience, I know that it was done quite poorly. Adélaïde was not affected by her amputated leg or prosthetic in any significant way, despite there being several scenes where she had to walk for extended periods of times or climb multiple sets of stairs at once. And while I loved the style of the illustrations, they fail to add anything to the overall story. Oliver and Archer were also quite indistinguishable from one another. I definitely was not as impressed by this as I expected, and there was nothing about it that made me want to continue with the series. I was originally considering rating this one two stars, but the abundance of fawning, slavish five star reviews ignited an incandescent author-illustrator rage that demanded a one star review. That, and upon reflection, The Doldrums committed the worst creative crime of them all: utter mediocrity. Yes, there is not much that is especially objectionable about this book, but there is also almost nothing to praise either. If you are Nicholas Gannon and you are about to read this, I am sorry in adva I was originally considering rating this one two stars, but the abundance of fawning, slavish five star reviews ignited an incandescent author-illustrator rage that demanded a one star review. That, and upon reflection, The Doldrums committed the worst creative crime of them all: utter mediocrity. Yes, there is not much that is especially objectionable about this book, but there is also almost nothing to praise either. If you are Nicholas Gannon and you are about to read this, I am sorry in advance. Archer Helmsley, an apparent "dreamer" longs to live up to the name of his famous explorer grandparents, who are missing and presumed dead. Unfortunately his sub-par efforts to emulate them are mildly thwarted by his bafflingly restrictive mom and feckless dad. Add to the mix one reluctant sidekick, Oliver Glub, a villainous Trunchbull-meets-Aunt-Marge teacher, Mrs. Murkley, and a spirited Parisian ex-ballet prodigy with a wooden leg, Adelaide Belmont. All of this is set in a fictional world that is equal parts Bryan Fuller, Jean Pierre Jeunet, and Wes Anderson (which sounds great, right? ), except the character, charm, and especially action is dialed down from a 10 to a 2. Maybe even a 1. It is as if readers are expected to float through this heavy tome without much more to entertain them than mild quirkiness. Somewhere over halfway through the novel, appallingly late, Archer has an epiphany and resolves to find his grandparents on the iceberg where they disappeared in Antarctica. And although the cover of this book suggests our trio of eleven-year-olds might just make it, SPOILER ALERT: (view spoiler)[they don't even get close (hide spoiler)]!!! Here is where I will talk about the most frustrating aspect of this book. The Doldrums seemed to repeatedly suggest potentially exciting avenues for the story only to later abandon them. Excuse my crudeness for a moment, but if this novel were a potential hot one night stand, us readers are the guy stricken with the worst case of blue balls ever experienced, stumbling alone into the dawn, questioning how absolutely nothing but repeated teases filled the better space of nine hours. For all the dreaming our narrator tells us Archer does, his dreams are quite dull and inspire almost nothing in the way of readable story content. Very little actually happens in this book. The preparations for potential adventures could have been interesting. Maybe they would reveal fictional or real facts about famous explorations or explorers (not so much). Maybe they would lead to heart-warming or hilarious hijinks (nope). At one point, our trio goes shopping for supplies (view spoiler)[for the adventure that they will not have (hide spoiler)] and I kid you not, that is a high point in the action. Shopping. Perhaps one could argue that this book did not necessarily need a grand adventure (I will admit, I would probably have enjoyed that grand adventure version much, much more (especially when we are lead to believe we will get one)), but it at least should have some sense of a real struggle, then growth and accomplishment for our main characters. Some might disagree, but for me that very basic storytelling through-line was painfully absent. It is not too much to ask. I recently read a book about three girls who fail to learn baton-twirling and make a visit to a retirement home and animal control. Because that basic arc was there, I WAS RAPT THE ENTIRE TIME. I feel prepared to object to any element anyone claims is good about this book, but for now I will stick to the following few points. "The writing is excellent!" No. it is just alright. Gannon pulls out a few nice sentences here and there, but that does not a novelist make. Something that really irritated me and it seems few have mentioned was the sloppy structure. I am not talking about all the plot fake-outs I reference above, but the actual breakdown of each chapter. Random brief asides and flashbacks receive bold titles, cutting away from the established action often more than once in a chapter. Either Gannon was attempting some kind of a ill-conceived reference to silent film title cards OR he just did not feel like making the effort to write flowing, smooth transitions. Nowhere is this technique more grating than in a climactic museum chase, when every single room the children pass through is boldly titled before a quick description of the events that happen inside. "The characters are distinct and relatable!" I disagree. They are predominantly white, affluent, and simplistic. Or just confusing. Archer's parents make no sense. His mom is basically a secondary antagonist because she does not believe in him doing harmless activities such as playing outside the house in a nearby park (huh?). She thinks he has destructive or dangerous tendencies, which he does not. She thinks his harmless habit of speaking to taxidermied animals can be solved by requiring his attendance at formal adult dinner parties rather than making friends his age. For no satisfying reason, she forbids Archer to have any connection to his grandparents, whether through hiding away packages they addressed to him directly, or practically burying the luggage that arrived at the house when they disappeared. She just finds the exploring Helmsley's and their friends... unsavory? Meanwhile, Archer's dad seems more sympathetic to adventurous urges, yet he always defers to his wife and seems to have completely accepted that she decided he would not interact with his parents ever again (what?). Archer's parents are generally well meaning, but they are also kind of Dursleys-lite... and maybe... possibly... the bad guys in this story, so readers are left with a lukewarm question mark hovering over them. The problems with the other characters are simpler. Mrs. Murkley is a less entertaining rip-off of the work of more talented authors. Some might say how original it is that Adelaide has a wooden leg. Do not be fooled. There is no real investigation of what that experience means for her. It is just a character quirk stuck on what is basically a manic pixie dream girl for eleven year old boys. Archer is just so short of the protagonist this book deserves that it is sad. He nudges the plot forward with one unconvincingly stupid mistake after another, rather than making real decisions that have real consequences. He should feel like a genuinely thwarted adventurer. What we get at the conclusion should have been one minor incident in a series of similar calamities listed in the first chapter. He should openly defy his mother. He should get angry and upset and yell when she takes the few connections he has to his grandparents away. Instead he is mild, safe, bland, sometimes dumb. What eleven-year-old, let alone one who supposedly reads a lot, thinks eating large quantities of ice will prepare you for an antarctic expedition? He is a bad explorer AND a bad friend. Oliver is the least bothersome because he fulfills the expectations the story creates for him. But I still think his habit of running around with his eyes closed is silly. "Nestled inside this adventure story is one about friendship!" If so, it is not a good one. The potential for actual conflict is there. Oliver does not want to be doing any of the auspicious things Archer dreams of accomplishing. He thinks about quitting his friends constantly and pretends not to know them around Mrs. Murkley. Neither Oliver nor Adelaide seem bothered by this. More significantly, Adelaide tells a series of huge lies to the boys, lies that it should be upsetting to discover, and finally reveals all in a moment when everyone is about to run for their lives and no real emotional impact can be had. She is forgiven without anyone finding their way to forgiveness. In many good stories about friendship, parties have to come apart before they can repair the relationship, learn to see things from each other's perspective, and forge a deeper bond. Not here. The kids meet and then with not much more to tie them together than a shared dislike for their teacher and the fact that they are all neighbors, they are suddenly having cozy rooftop sleepovers and eating too much pastry. 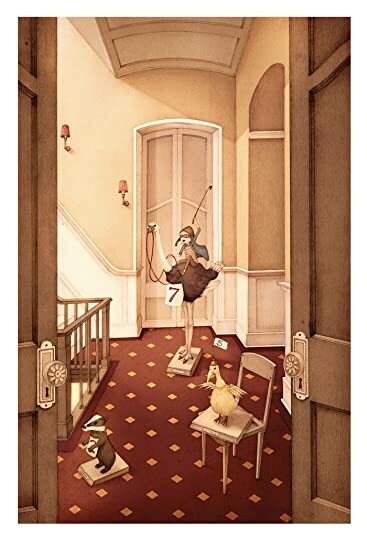 "The illustrations are gorgeous and perfect" I am going to put on my snobby illustrator beret for a minute so I can tell you that if you think this, you are wrong. These pictures are far from awful. They are quite polished. But more than polish is needed to visually tell a story. Just like the written element of this book, there is a lifeless, dull quality throughout. The main reason why is because Nicholas Gannon never really depicts narrative action. A climactic museum stand-off is so plainly imagined that I think I audibly scoffed upon seeing it. Another problem is how similar and inexpressive his characters look. Rather than adding any real emotional depth or intrigue or excitement to the book, it feels more like someone sedately playing with dolls in a fancy vintage dollhouse that is only used once every couple years. The pictures are not lonely enough to evoke loneliness, nor sad enough for sadness. There is no danger or excitement or dejectedness or celebration. They are plain as can be. They are not true illustrations, just visual world-building sketches filled with fussily executed architectural detail. Finally they are far too randomly dispersed through the text, with so many at the beginning that the designer had to place short paragraphs hovering on an opposite blank page more than once. Again, just like in the story, some more thought out structure would have been nice. The Doldrums is Nicholas Gannon’s debut novel, published in September of 2015. Now not only did he write this charming book, but he also illustrated all of the whimsical illustrations within it. And I have to say, the art style is PERFECT for a middle-grade book. But illustrations aside, let’s talk about the story. Archer Helmsley was a dreamer ever since he was born. Archer is grandson to renowned explorers Ralph and Rachel Helmsley, and he looks up to them immensely despite having never met them. On his ninth birthday it’s discovered that his grandparents have been lost in the Antarctic stranded on an iceberg. He grows up living in his grandparent’s house which does much to inspire his adventurous imagination. 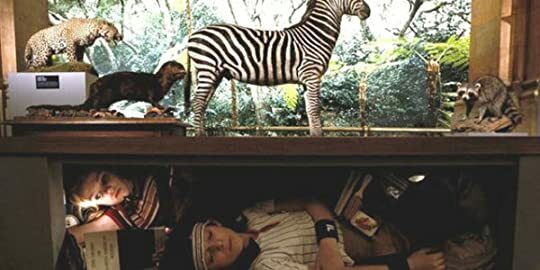 You see, the house is filled with tons of wacky things belonging to his grandparents, some of which include taxidermy animals such as a giraffe, polar bear, ostrich, and penguins. He lives here with his parents who are not like his grandparents. They don’t have the same adventurous spirit. In fact, the mother is so scared Archer will end up stranded on an iceberg or something similar, that she locks him in the house (besides him going to school) and tries to keep him away from his grandparents influence. This only strengthens his yearning for adventure as he has nothing else to do, and ends up talking to all the stuffed animals. One day some mysterious packages arrive containing items from his grandparents exhibitions, and Archer decides it’s about time he plans a journey to head to Antarctica to save his grandparents, as he’s determined they’re not dead. Now, the story is set up into three parts. The first part introduces us to the characters, Archer being one of them of course. He also meets a friend who lives next to him named Oliver, and they meet up on Archer’s balcony and roof to plan their adventure. The next friend he meets who joins in on his plan is a Parisian girl by the name of Adelaide Belmont (pardon my French). She is my favorite character out of the trio, as she has the most interesting back story. She also likes croissants and coffee, and has a wooden leg. Wooden legs are cool. The second part is dedicated to planning for their adventure, and the third part I don’t want to spoil, but let’s just say the subtitle of the book suits this story perfectly. I was surprised when looking at GoodReads, to find many negative reviews stating that this book was slow moving and boring. That thought never crossed my mind, as I read the majority of the book in one day, and thoroughly enjoyed it. The writing is witty, using many literary devices and a lot of subtle humor to draw you in. The wordplay made this book quite a bit of fun and made me reminiscent of A Series of Unfortunate Events. I can agree, that if you went into this expecting a huge adventure then it may have been a tad disappointing, as adventure doesn’t swoop you off your feet here, but it does build up for the second book. I read this book at a perfect time, having just finishing the long (and amazing) Mistborn series by Brandon Sanderson, I needed a easy reading middle-grade to pick me up from the high. The Doldrums was quite enjoyable, and the charming illustrations are an added bonus. Just a heads up, only the hardback edition has colored illustrations. Ειχε μεγαλες πιθανότητες να γίνει η επόμενη σειρά από ατυχή γεγονότα αλλά ο συγγραφεας δεν επέδειξε την ίδια συγγραφική δυνότητα. Παρόλα αυτά θα ήθελα να διαβάσω και την συνέχεια. Many books have what I call the "cookie cutter mentality". A rampantly cliche requirement by modern publishers to start off in an action scene with the main character. I hate books like that. I want to get to know my character first. This? This is NOT one of those books. I never thought I would say this, but I mean that in a bad way. This book went on and on and on ... about nothing. I was 22% of the way through, a book about a kid in, ya know I really don't know, and I realized: there is no stor Many books have what I call the "cookie cutter mentality". A rampantly cliche requirement by modern publishers to start off in an action scene with the main character. I hate books like that. I want to get to know my character first. This? This is NOT one of those books. I never thought I would say this, but I mean that in a bad way. This book went on and on and on ... about nothing. I was 22% of the way through, a book about a kid in, ya know I really don't know, and I realized: there is no story. Now, one would assume that he would go to save his grandparents. Maybe he did, I couldn't get that far. Like I said, I was 22% of the way through, and all I knew was that there was this kid whose mother was terrified he would be like his grandparents, and that his grandparents were exciting explorers. (Supposedly, although this is the last book to look for excitement.) But that's it! No seriously, that was it! One-fourth of the way through, and that was everything I knew! Ahhh, I loved this book. It's a book for all the dreamers who ever argued with a doer that without dreams what is there to do? I had this argument in a writing class in high school, I'm not sure what that particular doer was doing in a writing class, but that's another discussion. This book was also a great example of why I love children's literature. It strips away all the extravagances that adult writing insists on and gets down to a good story with characters who are you or were you, at least Ahhh, I loved this book. It's a book for all the dreamers who ever argued with a doer that without dreams what is there to do? I had this argument in a writing class in high school, I'm not sure what that particular doer was doing in a writing class, but that's another discussion. This book was also a great example of why I love children's literature. It strips away all the extravagances that adult writing insists on and gets down to a good story with characters who are you or were you, at least in your mind. I was hooked before from the first page, but chapter 4 sealed the deal. Well, that and a ballerina who loved chocolate croissants. I highly recommend this book to young dreamers or ones who used to be young or anyone who knows one of them or the other. Not everyone will probably get it, but if you do then you might love it like I did. This was so so so so perfect. I loved this book so so so so so much. This won't be a proper review but I will say.. This book gave me all the feelings! And that ending though.. the best ending ever. A million stars out of 5. Well the title says it all....the doldrums are when the winds don't blow and a ship can't get to where it's going....nothing happens......precisely. One star! At least the title is appropriate. I would like to try to leave a constructive review, but this book continually made me more and more angry as I kept going and NOTHING HAPPENED. I so badly wanted the adventure that is promised and never delivered. This book would be a good read for a voracious reader who consumes a lot of books each week and wouldn't be bothered by something so dull. However, this will be poison for a reluctant reader. I guarantee it. A child who "doesn't like reading" will take this as further proof that "books I would like to try to leave a constructive review, but this book continually made me more and more angry as I kept going and NOTHING HAPPENED. I so badly wanted the adventure that is promised and never delivered. This book would be a good read for a voracious reader who consumes a lot of books each week and wouldn't be bothered by something so dull. However, this will be poison for a reluctant reader. I guarantee it. A child who "doesn't like reading" will take this as further proof that "books are boring". The Doldrums follows three children: Archer, Oliver, and Adelaide. They never leave town and don't really do anything, except go to school, meet each other on the roof, and sneak out to ride the bus to a store. At some points I question if they even like each other, because their friendship isn't shown to develop, and there are spots where it is highlighted that Archer isn't even listening to (or care about) what Oliver is saying, or Oliver suddenly wants to weasel out of the friendship and leave Archer and Adelaide together to plot their adventure. (Imagine if Ron bailed on Harry after the troll attack??) The adults are either cartoonish, hazily-motivated antagonists intent on squashing any ideas of fun, or they are so laissez faire that the kids are ignored for hours on end (or both!). Imagine if Harry Potter never left the Dursley's house, and Ron, Hermione, and Aunt Margorie Durley all live nearby. Harry & Co. spend the entire story half-heartedly "wishing for some vague adventure" and then, at the end, Harry's sent off to Hogwarts/Azkaban by his onesies. This is The Doldrums in a nutshell. Nicholas Gannon is one author worth watching! This book, his debut, is perfect for kids with an eye for adventure and for fans of Roald Dahl. They will enjoy the misadventures of the three protagonists of this story as they face-off against cruel schoolteachers, unaware parents, and other adults who just get in the way of kids having fun. 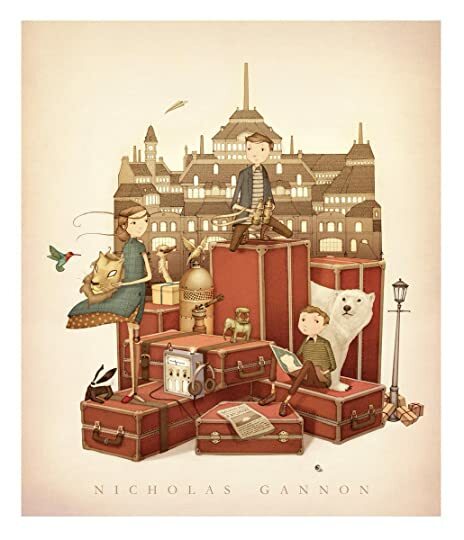 They will be able to relate with one or more of the kids in this story, who all have something that sets them apart from their peers (even if they are not trul Nicholas Gannon is one author worth watching! This book, his debut, is perfect for kids with an eye for adventure and for fans of Roald Dahl. They will enjoy the misadventures of the three protagonists of this story as they face-off against cruel schoolteachers, unaware parents, and other adults who just get in the way of kids having fun. They will be able to relate with one or more of the kids in this story, who all have something that sets them apart from their peers (even if they are not truly unique, I see nothing wrong with kids innocently believing they are)! That being said, I would like to see Gannon more fully explore some of the secondary characters, particularly the women of his stories. The moms here(two, at least) are nagging, malicious and overall, no fun! It is the fathers who encourage the kids to explore, and wink behind the mom's backs. The female teacher is also quite one-dimensional. Especially for girl readers, having more fully realized female adult characters can be quite empowering. Also, I found the ending a bit anti-climatic, given the build-up. It was a little too Harry-Ron-and-Hermione for my taste, and all the adult characters were, at best, unsympathetic. The mothers, of course, are evil and fathers benignly out to lunch. But I enjoyed the clever dialogue and lovely illustrations, and would be willing to read the next—obviously there will be a next one, presumably this will be a trilogy—but I'm not dying for it to come out. Edited to add: Oh, wait! There was one mother, Oliver's, the Mrs. Weasley character, who was not evil. She bake It was a little too Harry-Ron-and-Hermione for my taste, and all the adult characters were, at best, unsympathetic. The mothers, of course, are evil and fathers benignly out to lunch. Recommended by Brooks as Wes Anderson-inspired MG.
Delightful and laugh out loud funny! Now onto the sequel! It strikes me as slightly paradoxical to enthusiastically praise the wild misadventure and daring do of a book called The Doldrums but the quite frankly brilliant Mr. Nicholas Gannon is forcing me to do just that. This utterly charming book kept me and my seven year old son fully engrossed for weeks of bedtime reading. The misadventures of Archer Helmsley and his friends Oliver (who's father runs the titular "Doldrums Press") and recent arrival Adelaide have almost a dream like quality to them. T It strikes me as slightly paradoxical to enthusiastically praise the wild misadventure and daring do of a book called The Doldrums but the quite frankly brilliant Mr. Nicholas Gannon is forcing me to do just that. This utterly charming book kept me and my seven year old son fully engrossed for weeks of bedtime reading. The misadventures of Archer Helmsley and his friends Oliver (who's father runs the titular "Doldrums Press") and recent arrival Adelaide have almost a dream like quality to them. Totally enchanting and deliciously amusing even though they're often simply lying on the rooftop of Archer's house dreaming up adventures to have. Archer spends his days as a virtual prisoner in his own home. A home that once belonged to his grandparents, the most famous explorers who ever lived. He idolizes this mysterious pair who he has never met. As the story begins they have just gone missing while exploring an iceberg in Antarctica and are presumed dead. Determined that Archer should not meet such a fate and concerned over what she calls his "tendencies" toward chaos and destruction his mother refuses to let him step a foot outside the house except to go to school. He longs desperately to follow in his grandparents footsteps and dreams of finding their iceberg and saving them. Fortunately when he makes the acquaintance of Oliver who's own jovial, comfortable family life is the exact opposite of his own he begins to see the possibility of escape. When Adelaide arrives, a transplant from Paris, France, in desperate need of escape herself the trio is complete and they begin to plan a daring escapade that will free Archer and set them on the road to Antarctica. There's a lovely, meandering quality to this book. Though often not much more than three children hatching plots is going on there's some internal magic to Gannon's writing that infuses the whole book with a bright, energetic light. His dialogue is perfect, there's plenty of sarcastic humor for grownup readers and I know my son delighted in Archer's antics and his persistence in realizing his dreams. You really root for these kids. There's also Gannon's brilliant, art decoesque illustrations to delight in. They've got a fantastical quality to them and the color palate never strays to far from pale greens and browns against a tan backdrop. You really do get the sense that you're in the doldrums. But rather than the dank, boring world that word implies Gannon instead gives readers a dreamy, quietly contemplative wonderland that I dearly hope is only the beginning. If Wes Anderson ever wrote a twee middle-grade book, this would be it. Archer Helmsley's famous explorer grandparents have been missing his entire life, but they are really missing now -- adrift on an iceberg, in fact. Despite his house being full of testaments to adventure courtesy of its former owners (the missing grandparents), Archer leads a very sheltered life thanks to his mother. 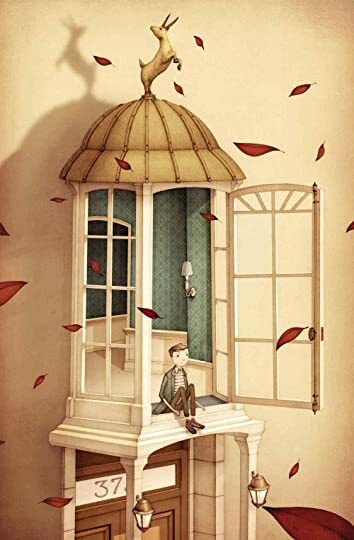 That is, until he meets Oliver Glub, his shy neighbour, and the mysterious new girl across the garden, Adelaid If Wes Anderson ever wrote a twee middle-grade book, this would be it. Archer Helmsley's famous explorer grandparents have been missing his entire life, but they are really missing now -- adrift on an iceberg, in fact. Despite his house being full of testaments to adventure courtesy of its former owners (the missing grandparents), Archer leads a very sheltered life thanks to his mother. That is, until he meets Oliver Glub, his shy neighbour, and the mysterious new girl across the garden, Adelaide Belmont, who's wooden leg is said to be courtesy of an alligator attack. The three of them decide to prepare themselves for an adventure, on the sly of course, to find and rescue Archer's grandparents from Antarctica. Ugh. This had to be the most boring, uninteresting books I have ever read. Archer, the main character, is very, um, boring. He does not catch my attention, he isn't a good role model, and we learn little about his character-no character development. The other boy, Oliver, is a brat. The girl is boring too. no character development in any of the kids. I was 2-thirds the way through and nothing remotely interesting had happened. Plus, the way the story was told reminded me of a toddler's book. Arc Ugh. This had to be the most boring, uninteresting books I have ever read. Archer, the main character, is very, um, boring. He does not catch my attention, he isn't a good role model, and we learn little about his character-no character development. The other boy, Oliver, is a brat. The girl is boring too. no character development in any of the kids. I was 2-thirds the way through and nothing remotely interesting had happened. Plus, the way the story was told reminded me of a toddler's book. Archer did this. Then, he did this. Oliver sighed. You know what I mean? Too many pictures, too. Bleh! Absolutely beautiful writing and illustrations! This story takes you to a unique and charming world that totally captivates. The writing flows so easily that I found myself reaching for chapter after chapter as the hours melted away. And the characters themselves were rich and well defined. The harmony the three main characters share though is absolutely touching. This story is a real comfort to gently savor. This is book one and both in terms of where the plot leaves you and the overall experienc Absolutely beautiful writing and illustrations! I like the writing style, I like the characters but sadly nothing really happened in this book. You've got this promise of big adventure and all, and at this end of the book you keep waiting for it to happened. I definitely didn't expect to like this as much as I did, and I dove straight into the second book after finishing this one. If you're in need of a fun middle great, I'd definitely go for this one. It has so many great elements, from the main character's grandparents being famous explorers and him desperately trying to go on an adventure, but it all going a bit (or a lot) differently than planned, to the amazing friendship and characters. Reading this made me incredibly happy. Um so this book is magical and fun and totally reminds me of being a kid (which I guess is a good thing cause it's middle grade lol). I loved pretty much everything about this book (if you can't see from my rating lol). The characters were fun (though I would like to say that there didn't need to be so many mean adults), the world was whimsical, and this book was so full of adventure. To be fair, not a whole lot actually happened plot-wise (aka it was a little slow), but it kept me engaged throu Um so this book is magical and fun and totally reminds me of being a kid (which I guess is a good thing cause it's middle grade lol). To be fair, not a whole lot actually happened plot-wise (aka it was a little slow), but it kept me engaged throughout. Except for those action-packed chapters like the polar bear incident and other amusing happenings. It was just so fun. I don't think I've had this much fun reading a book in a while. The book is well written,the characters are fun, the pace is slow. I don't hate it but I need something immersive right now and this is not it. I'll probably (maybe) return to it at some later date. “If someone tells you they love turkey smothered with cranberry sauce, that they love it more than anything else in the world, you might spend the day roasting that someone a turkey and smothering it with cranberry sauce. If that same someone then takes one little bite and says, 'That'll be all, thank you,' you'll likely go red in the face and hurl both these turkeys our the nearest window because clearly, this person never loved turkey smothered with cranberry sauce in the first place.